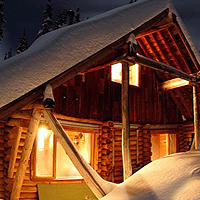 In order to respect the sanctity of secret ski shacks, we’ll focus on establishments which are public and or affiliated with an organization such as Backcountry Lodges of BC. If you are looking for some route beta in the Coast Mountains check out our Coast Mountain Routes page here. What's different about Burnie Glacier Chalet? 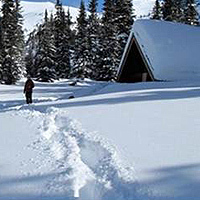 Being the most northwest of all lodges in B.C., big stable snow packs are the norm from December to May. But we are also the easiest to reach: fly into Smithers and forget about rental cars and long drives – the heli base is just across town. The terrain appeals to stronger skiers with many demanding, glaciated lines, rugged peaks and excellent tree skiing for stormy days. Introductory courses, advanced avalanche training and professional courses are offered. Plus, there’s solar electricity, a wood fired sauna, wonderful food and IFMGA Mountain Guide Christoph Dietzfelbinger to lead the way. Callaghan Country is a wilderness adventure playground in BC’s southern Coast Mountains – only 1.5 hours from Vancouver and 25 minutes from Whistler - with ski touring, groomed XC trails (classic track and skate), snowshoeing, and tobogganing in the winter months and world class hiking, climbing, biking and horseback riding during the summer months. 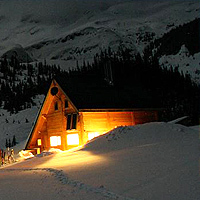 Stay at Callaghan Lodge (1,370 metres, 4,500 ft), an easy-access inn boasting spectacular scenery, epic snow, comfortable lodging, delicious meals and friendly hospitality. Come for a day, a night, or stay all week! Nightly all inclusive packages available. Have a read over our review of Callaghan Country and the Journeyman Lodge, complete with photos and a nifty video, click it here. Amenities: Wood heat, propane cooking and lights, solar powered lights, wood-fired sauna, dry rack, sat phone rental, outhouse. Located at 6300’ Eldorado Cabin has great skiing right out the back door. Located on the east edge of the coast snow zone the area receives an abundance of snow and sunshine. This is a cozy Cabin with basic amenities for your private group. After a hard day's ski-touring you can relax your muscles in our wood-fired sauna, perfect for winding down. There are options for accessing the cabin - you can ski in and out, snowmobile into the park boundary and ski in from there, or charter a heli flight with our partner Blackcomb Aviation from Lillooet with additional bump from Tyax Adventures base ranch. We are a mountain adventure company dedicated to providing distinctive backcountry skiing and snowboarding trips in the South Chilcotin Mountains of British Columbia. Our goal is for you to explore these mountains and discover the excellent and challenging skiing here. With emphasis on service and safety we can guide you through this exceptional terrain with its perfect alpine bowls, mountain summits with long glacial descents, and fantastic deep powder glades right outside the door. 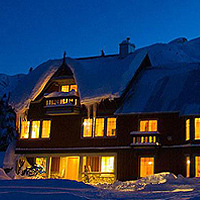 We offer ski and bike enthusiasts an affordable stay within rustic yet upscale accommodations. Timeshare resorts such as Mountainside Lodge and Raintree’s Whiski Jack at Valhalla Whistler can be found in our impressive online database. Many of the resorts are located right in the alpine resort village, offering easy-access for seasonal travelers. 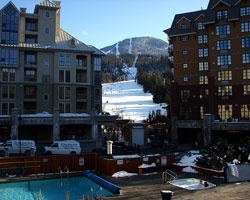 Staying in a Whistler timeshare from Timeshare-Resale-Rental allows you to experience the ultimate in outdoor winter adventure due to the resorts’ close proximity to the packed corduroy of Whistler-Blackcomb Ski resort and the surrounding back country trails. As a guest you will have access to ski in/out slope side options, sleigh rides, and ski school lessons. For the remaining seasons there is no shortage of things to do including tennis, horseback riding, and hiking. Enjoy all this for far less than booking directly through the resort!